World Wide Travel One is pleased to announce the launch of TripCase by Sabre providing our corporate clients with the latest technology once again. TripCase is the newest technology available to deliver electronic reservations to corporate clients in a significantly improved format and functionality. The travellers reservation details can now be accessed through the latest Android Phone, Blackberry, I Phone or other major PDA device. Corporate travellers will now be able to access, change and update their travel reservations directly from their PDA device. TripCase will provide our clients with the latest up to the minute real time flight arrivals/departure information, airport gate information, aircraft type, delayed and alternate flight details and host of other information. This will include updated information on car rental, hotel reservations, driving directions, ground transportation options, local attraction information all from their personal PDA device without having to search for this information. 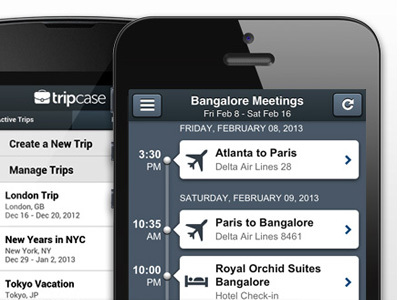 TripCase will allow travellers to automatically load travel details into their personal calendars and share their information with a host of colleagues by touching a single button. New enhancements on the horizon will include ability to change your flights from your PDA without having to call us. Thinking of Retiring and Selling Your Travel Office? Why Not Fly For Less This Year With Us!